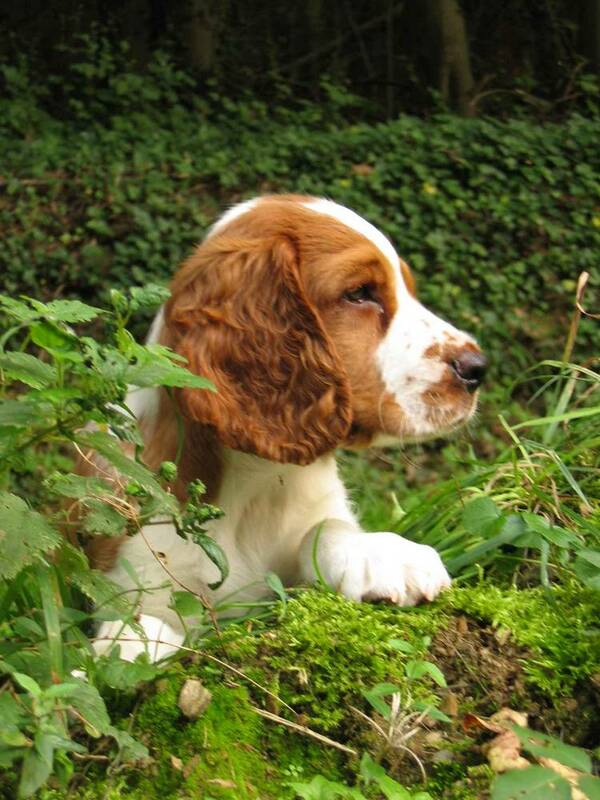 Compact and muscular, the Welsh Springer Spaniel is built to work. The length of its body is slightly longer than its height, keeping a balanced build. The skull is slightly domed with a defined stop; dark, oval eyes give the breed a kind expression. The ears narrow towards the tip, are lightly feathered, and are held at eye-level. The muzzle is equal to the length of the skull; it is straight and holds a scissor bite. The tail is docked and held either horizontal or slightly elevated when excited. The coat is not wiry, but soft and straight. It is thick and dense to protect the dog against the elements. The backs of the legs, the chest, the belly, the ears and tail are all feathered. The color of the coat is red and white in any pattern. 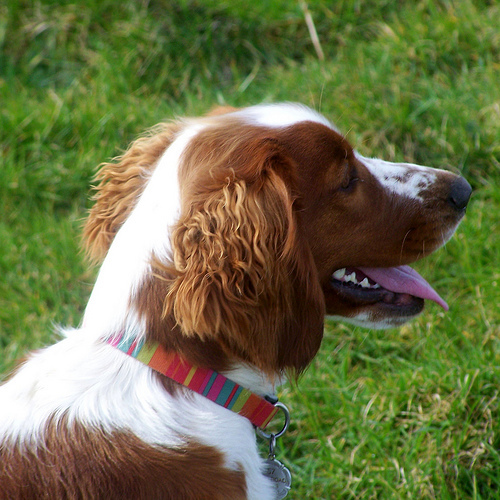 Common Misspellings Welsh Springer Spainel or Welsh Springer Spanial. 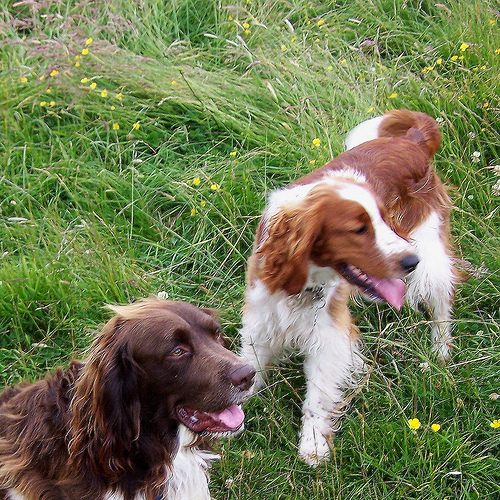 Welsh Springer Spaniels get along well with children, pets and other dogs, but are often shy around strangers. This can be remedied through socializing the dog from a young age, but do not expect the Welsh to welcome strangers in the same manner a retriever might. The dogs intelligence and long hunting history add to its trainability, but its independence and occasional stubbornness take away from it; a firm and in control owner should have no problem training this dog. 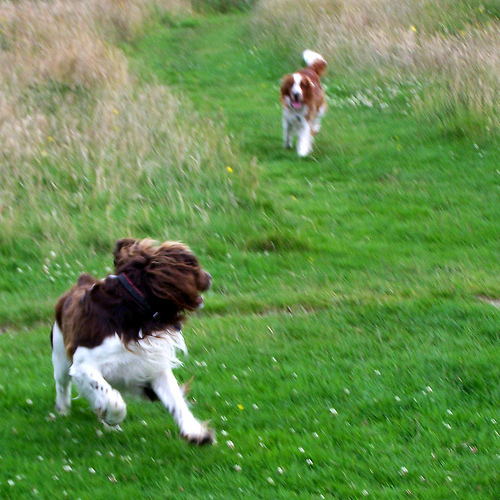 It needs daily romps off leash so it can run and sniff. 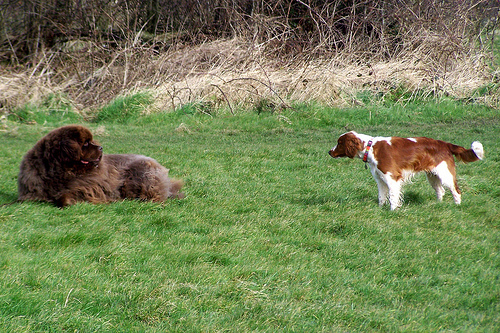 If not exercised sufficiently, the breed can become bored, overweight, and possibly destructive. 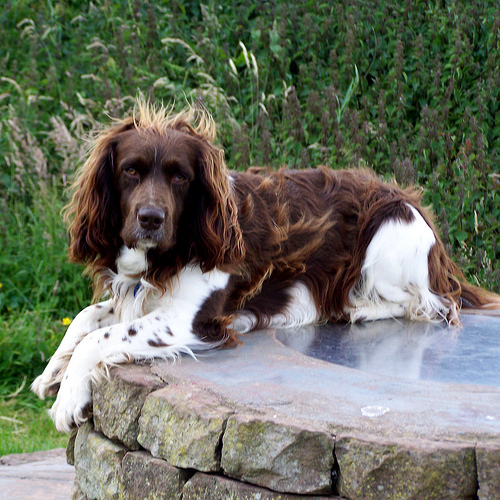 The Welsh Springer Spaniel is an average shedder and must be brushed regularly to gather dead hair; during shedding season, brushing can be a daily ritual. Bathing should be done only when necessary and ears should be checked for infection often. 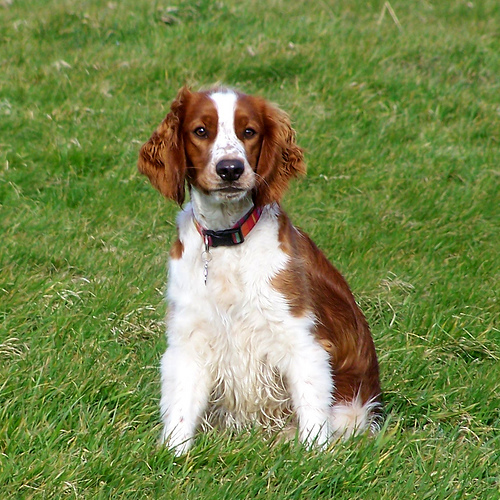 The Welsh Springer Spaniel is a fairly healthy breed; occasionally one will see canine hip dysplasia, otitis externa, glaucoma and epilepsy in the breed. 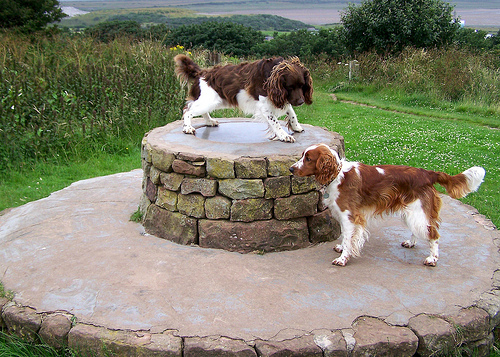 A document issued early in the 14th century called the "Laws of Wales" makes mention of a Welsh Springer Spaniel, but whether this dog bears any resemblance to the modern breed is unclear. 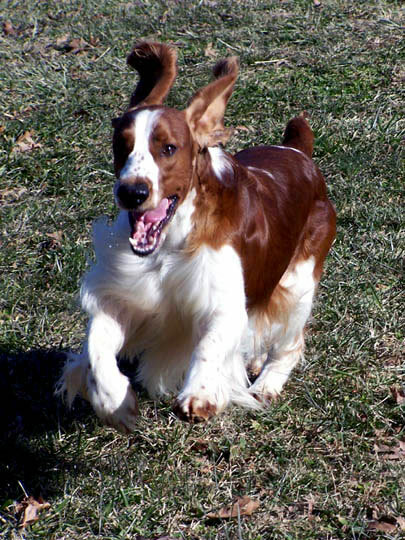 The Welsh Springer Spaniel developed from stock similar to that of the English Springer Spaniel, and in fact for most of their history these two breeds along with the Cocker Spaniel were considered essentially the same, the only differences being size and color. 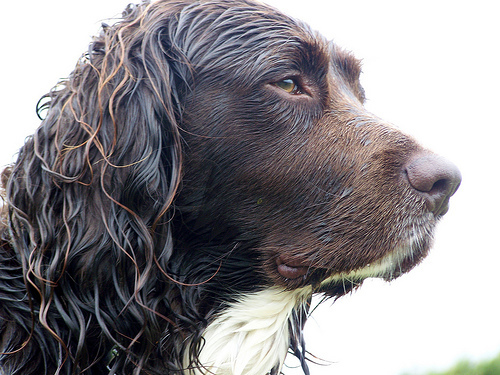 These dogs were used to flush birds and other game from hiding by springing at them.Over time, the Welsh and English Springer Spaniels developed along their own separate lines, and by the 19th century they were no longer considered to be the same breed. The Welsh Springer Spaniel was introduced to the United States late in the 19th century and recognized by the American Kennel Club in 1906. The breed failed to catch on in America, however, and was virtually extinct there by the end of World War II. 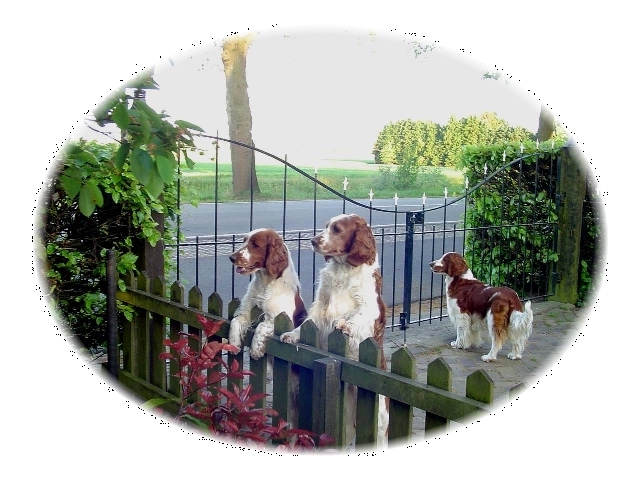 Renewed importation of the breed around this time brought the Welsh Springer Spaniel back from the dead, and since then the breed has experienced a modest but steady rise in popularity. 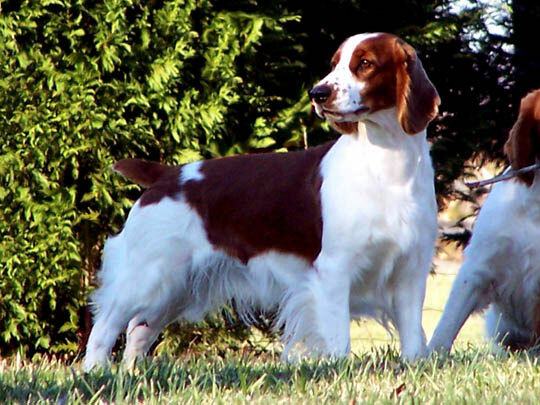 The Welsh Springer Spaniel is still rare in the United States today.